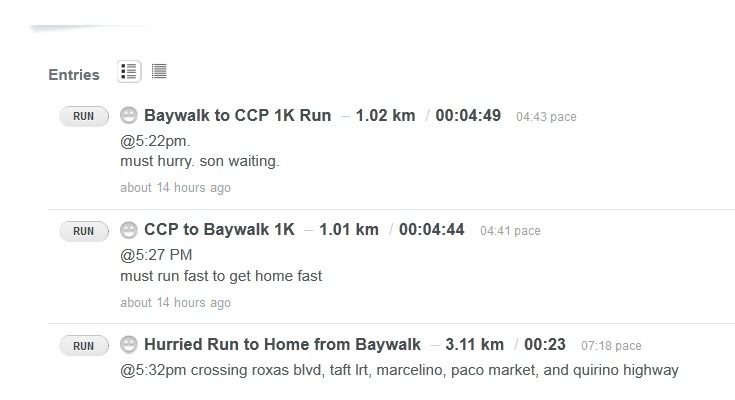 1 km jog from Remedios to CCp in 00:07:23. 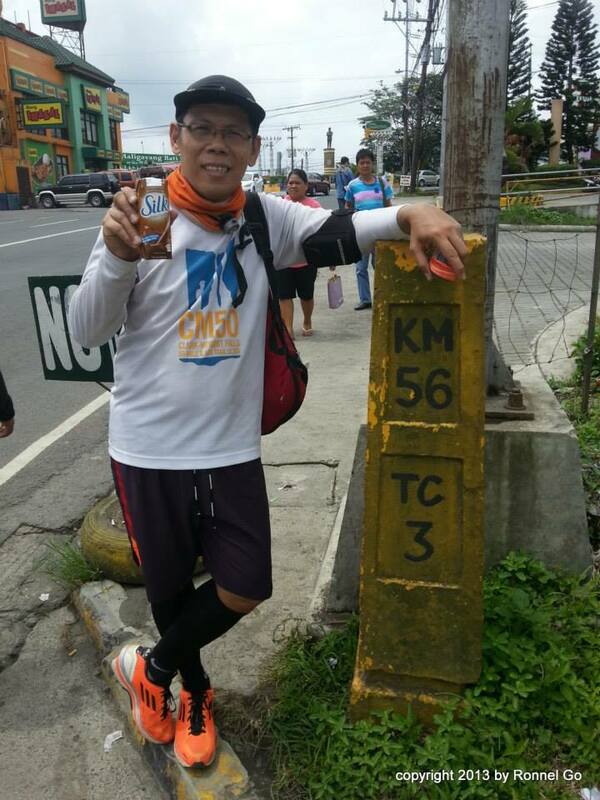 3.02 kms easy-tempo-easy loop run @ ccp ramp in 00:20:31. 3.23 kms walk in 00:37:00. ***registered already and still in training. 1 over Tender Juicy Hotdog and Spam! No RUN. Just a lot of rest. Painful knee. Injury is not running related. 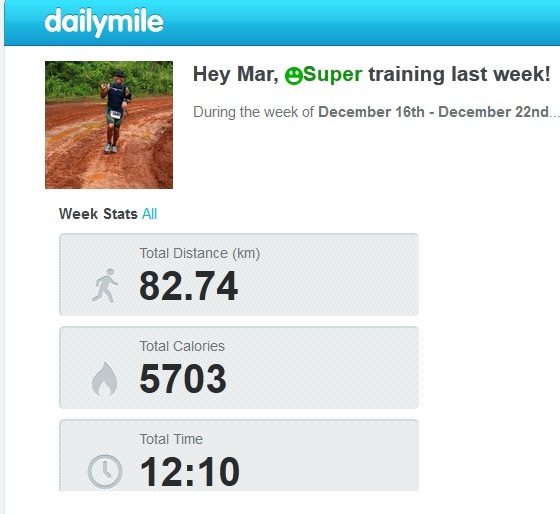 Run for the whole week totals: 82.74 kms including walks in 12 hours 10 minutes. 21 workouts. Morning Run @ Plaza Dilao. 1 Selecta Rocky Road popsicle? with Orange adiZero F50 Racer. 1 @ 11:45am Nescafe 3-in-1 Coffee over 1 choco-marble cake. 90-minute micro 10 9:1 Jog Walk. 11:36 in 1:30:00. All thanks and praise be to God! 1 chewy Ensaymada! very delicious! All thanks and praises be to the Lord God, Almighty! Not until Friday morning was I able to get a ride going to Cavinti on Friday night. Thanks to Doc Minnie Tomas and Miko Sabado who gladly toook me in to their car. Praise be to God! The weather seemed nice. The temperature is so cold. The race was scheduled to start at 4:30am. 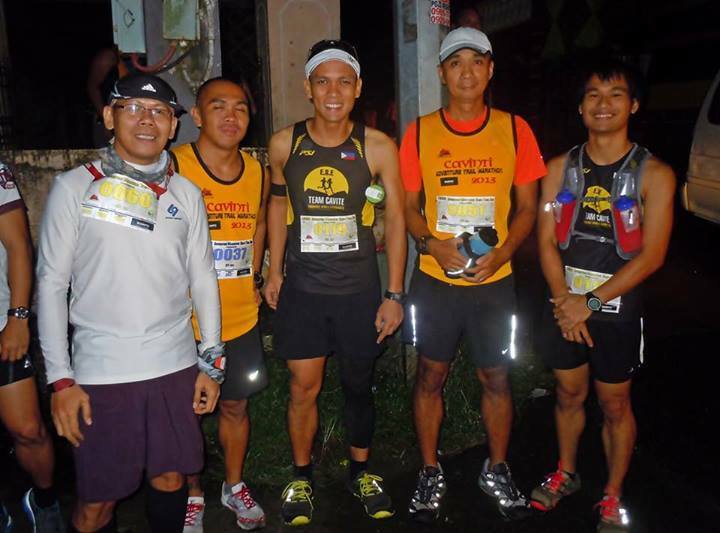 At about 4:10am, we heard an announcement that the 42K and 21K will start at the same time – 5:30am. Maybe because it rained? It did. To top it all, as the program continued for the Organizers, electricity in the town suddenly failed too. It’s too dark to start. Anyways, the race did start at 5:30am. It was a silent start. Everybody seemed to be cold or something else. As for me, I started with a brisk walk and slowly pushed the pace. 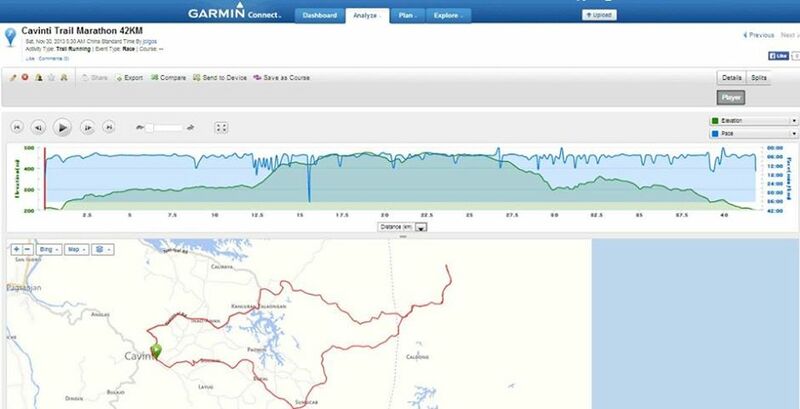 My garmin is not working well. I wonder why. Signal is not good too. So I turned it off until KM 107 marker of the road in Lumot Lake. I do know that I am running well and fast (for me). As we enter the trail, I was surprised to find an all-mud trail (again) like the one we had when we test-run the route. But of course, it’s a different game now that I am wearing a trail shoe – my Roclite 243 by Innov-8. 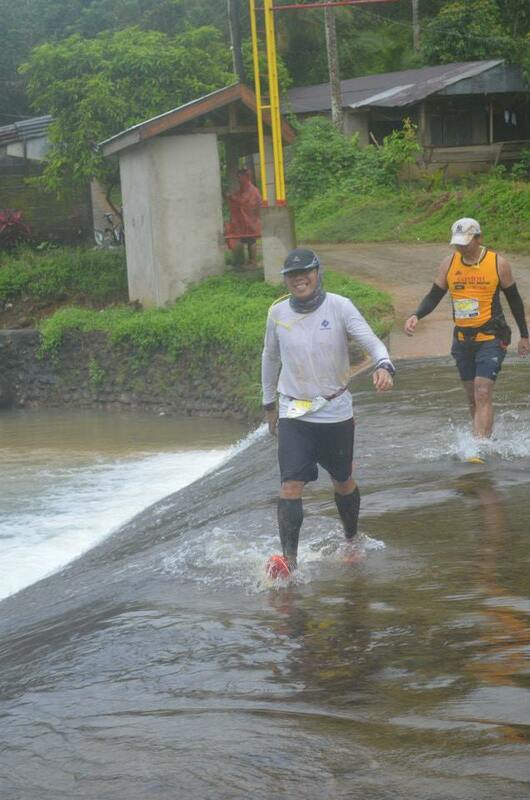 I was a bit hesitant at first to dash-through the mud – but I have no choice. It is really an all-mud route. Photo by Arvin. @the SPILLWAY from the trail. Re-charged here with a hard-boiled egg and gatorade. 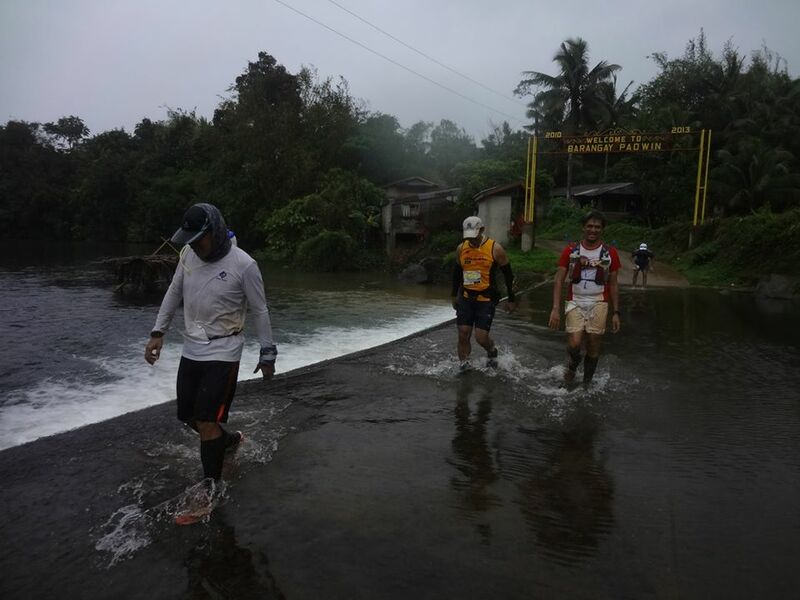 At this point of the race after the deep-muddy trail going to the road of Barangay Paowin, the spillway was a perfect spot for a good re-charge. I must mention though of the Delicious (make it 10x intense!) Giant Espasol. It was all I had and a hard-boiled egg for the entire race other than the drinks of Gatorade and Water refills. I carried nothing but my Simple Hydration (well placed at my nape) and a few sachets of Hydrite. I was running at a good easy pace. I can’t ask for more. I wanted to speed up but I like the way I am moving so far. No tired-feeling nor any pain anywhere. I did catched-up with Benj at the deep-mud trail before Paowin. From there up to the Finish Line, we were just running side by side. We both finished at 6 hours and 9 minutes. No more food left at the finish line. I did have 1 hard-boiled egg. I changed clothes after cleaning myself at the Spill Way and in the Bath Room of the Resort. It took a bit of a lot of time to clean the shoes and the socks (soaked in clay mud). After, I stayed in the car while watching runners finish. It was (for me) an easy run. Not because the route is easy but because I ran at my easy pace. The only part where I am at my tempo pace is at the road before entering the trail. The weather did changed from cold to very cold – so I moved a bit faster. The rain did stopped but the drizzle continued. It was a fun run in the trail running with people I have no idea who. But we have had conversations – lots of rants and funny remarks along as we progressed. It was also a never ending GOOD morning as we started seeing the counter-flowing Monsters of Running on their way back while we are on our way to the u-turn of the route. Even after about 2 hours after I crossed the finish line, the rain continued. Runners still came. Notable was one guy who was literally struggling with his left leg. He finished dragging that leg. I wonder for how long he endured. There was also this vendor on bike – a pansit vendor. I took a bite of his generous offer of the pansit habhab. It’s good enough. Even the putong bigas is good. Maybe I am just hungry. Maybe it was really good. 🙂 I’m not sure anymore. On our way back to Manila, we passed by Total gasoline station at SLEX where the Nike Factory is. But I decided to just buy a Cappuccino and a Banana-Choco Chip Loaf for a snack. At 6:30pm, I am already home to my family. We had dinner, and some nice chat before going to bed. It was overall a marathon worth trying. Without the mud, it will not be an adventure. Maybe, also, without the rain. Thanks to the hardwork of Joseph Prince Baltazar. This was just a simple idea before. Now, it has come to be a reality! All glory, honor, thanks and praise be to our Lord God, Almighty! 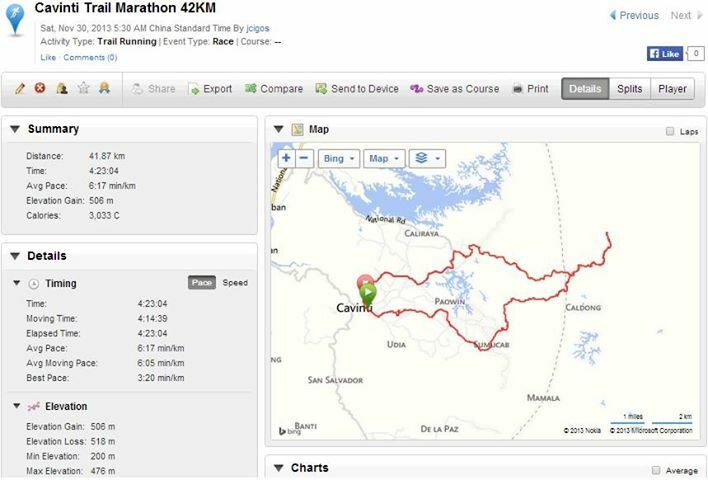 Thanks to JC Igos – THIS is his run record. Amazing time. The elevation detail and the figure of the trail. It’s not really that hard for the prepared – and is a titan to others. Click on the Image to know more! 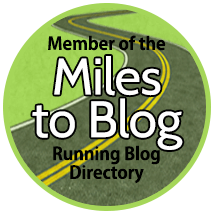 Make a donation to keep the Miles to Blog directory alive. Even $1.00 will help go to the cost of the domain name and host service. Thank you! Please visit us on Facebook or click on the envelope to contact Miles to Blog via email. If you are interested in ad space on this website, please contact the website owner via e-mail. If you are interested in a blog renovation for under $100, please e-mail the webmaster.